In the last three posts, we have discussed about the myths of self publishing that most seem to have and how to bust them, then how to design professionally looking and aesthetically pleasing covers for your books and how to write effective blurbs that compel your reader to buy your book. In this post, we will tap on the next feature your book should have — the Author Bio. Author Bio is an important yet often overlooked element of your book. It appears both in your book and also on the pages of your website, your blog and the websites you sell your book on like Amazon, Smashwords, Lulu and many more. It should talk about you, but more importantly, it should form a bond between you and your reader. In this post, we strip the Author Bio to its most basic and most important meaning -- showing the reader who we are as a person. Ideally, you need to talk about the experiences you had and how you look at life. This should be in line with the kind of book you have written. You’d need 3 versions of your Author Bio. First line is very important in your Author Bio. It should grab the interest of your reader. It should take a natural flow from there and make it easier for your reader to empathise with you. It should establish you as a trusted and interesting writer. It should make your reader think that this book written by you would definitely be as interesting, and even more, as your bio is. You should never write a bio just for the sake of it. Your bio plays a much more important role than you might think. How long should your Author Bio be? It depends on what you are writing it for. To publish it inside your book or on the back cover of your book, it needs to be concise. One paragraph. 100-150 words tops. If you're writing for websites like Amazon or Smashwords, you can be a little generous and add upto 50 more words. Beware: If you're writing Author Bio on the back cover, you should leave more than enough space for the blurb and other things (you should never write your Author’s Bio on the back cover of your books. It is explained why in the last section of this post). If you’re writing a long Author Bio, it’s advisable to use third person narration. Instead of I, me and myselfIt also makes it easy for your readers to read long bios.It also makes it easy for your readers to read long bios., use your name and third-person pronouns (Use your name much more than pronouns though). The reason a third person approach works better in most of the cases is because your reader will subconsciously feel that your bio is trustworthy. It also makes it easy for your readers to read long bios. If it is in first person, they may feel it’s self-indulgent and amateurish. The only exception is if you’re going for a personal connection with your readers. When written carefully, Author Bios written in first person are great. But it should be carefully chosen when to write Author Bios in first person because they fit with certain kinds of books, especially if it's a nonfiction and experiences you had or such story which is close to you, related to your life and you want to share with your readers. A professional photo for the Author Bio is more important than you can think of. Of course no one is going to recognise your picture when you are publishing your first book but it is important to give a personal human touch to your Author Bio. It helps your reader picture you while writing and also establishes a sense of credibility. But again, poorly taken pictures will have an opposite effect on your reader. That photo of you standing in the party with a beer, that doesn't go into your book. Look at the pictures of some of your favourite writers in their books and decide how your's will look in your book. If you have awards/certificates/accolades for anything related to your book, you have to not only mention that but highlight that. If you’re writing a fiction novel in which your hero is an investigative journalist (remember The Millennium series?) and you have a background in journalism or you have won an award for that, brag about it (yes, bragging is not bad and in fact it could be advantageous for you and your book if done in the right way). But don’t brag if that’s not your cup of tea. It might come off as rude. If you are a humble person, let it shine through your bio. Humility is one of the greatest virtues an author can have. If you are a member of organisations such as ACFW, mention it. If your education is relevant to your book, talk about it. If you’re writing a psychological thriller and you have a PhD in psychology, your reader would trust you more. If you have degree in medicine and you are writing a story of a doctor, then note it. Same goes with your career. If you are a teacher and you are writing a children’s book, then note it. But if you are a car salesman, then don’t. Mention your previous works that are related to your book. It IS okay to mention that you have previously written poetry in the Author Bio of your fiction novel if you are an indie writer and this is your first fiction book. But if you have already published a fiction work before, then mention that one instead of your poetry work. Mention your hometown and the place you live in, if it’s a different one. Your local people will identify you and this detail can help you in marketing or approaching local press or media. It also helps readers from elsewhere to picture you in your own habitat. Include Call-To-Action at the end of the Author Bio. This can be inviting your readers to your website or to explore other books you have written. Or this can be inviting them to connect with you on social media. This is also the right place to remind your readers to write a review for your book on the website they have purchased it from; encourage your readers to share a review and help other readers enjoy your book. Do mention your website address at the end of your bio. You can even mention links to your social media networks in an ebook. The more ways you offer your reader to know more about you and connect with you, the better. Be sure to keep on updating your bio. You might get new awards or launch more books. You might even get new certifications related to your book's topic. An Author Bio should always be evolving. You need to reflect the current you in your bio. Note to soloprenuers and freelancers: Your book would probably be related to your work. You need to highlight the kind of work you do or services you provide, how they help your clients and what your clients say about you. You need to tie this in with what the book is about, why you decided to write it and how the reader will benefit from reading your book. Highlighting your skills, experiences and your expertise in the topic you discuss in the book will add much more advantage to your book. Seriously! Unless you’re someone whose name stays in your readers’ mind and they can immediately picture your previous works. But if you are an indie writer, however effective you think you made your one-liner sound like, don't go there. Keeping it brief is nice. But don’t keep it too brief that there’s literally no information in it. This is an excerpt from the chapter Writing The Author Bios from my upcoming book Your Guide To Self-Publishing. In the original chapter, I discuss in depth about writing Author Bios for books to compete with those published by traditional publishing houses. We look at different first- and third-person narratives and which one to choose when. We will look at more examples and go through a simple framework to write your best Author Bio for any platform. Choosing The Right Platform To Publish Your Book - Different Options Out There And What's Best For You (Part 5 of #SelfPublishing series) — next post in series. Subscribe below to get notified when it goes live. To know more about Your Guide To Self-Pubishing, click here. If you want help self-publishing your book, click here. Your book blurb, also called as back-of-book description or your book’s cover copy, is probably the next most important element after your book’s cover. Most of the readers decide whether to buy a book or not after reading the blurb. So your blurb should be quite interesting and compelling for your reader. There’s a general perception that a blurb is only relevant for printed book to publish on their back covers. For ebooks, there are no back covers; ergo, a blurb is not necessary. This is not true. You can have a book blurb appear as a short description of your book on online sales pages like Amazon, Kobo, B&N and many more. You can also use your blurb as introductory content of the book page on your website or on your blog. It is necessary for submissions to any contests or awards. You can use it as a part of your email signature or in newsletters you send to your list. If you're a soloprenuer or a freelancer and if your book is related to the products or services you offer, you can talk about it in your emails so that your leads can be more enticed into visiting your blog, website and eventually purchase your book and, even better, your products or services. You can use your blurb as a part of offline or online interviews, press or media coverage. A long description of your book is not suitable for all the above situations because, well it’s long and there’s a limited space in all these situations. So you DO need a Blurb. Every story has to start somewhere. As much as this is true for your book, it’s also true for your blurb too. Every story, and every blurb, has a lead character. It has a problem. Something is at stake. A blurb should follow the same course a good story should. Starting with setting up a background to the story, your blurb should introduce lead character early on and show their emotional side. Then you need to let the reader know what the problem is, what is at stake and what stops your character from achieving her goal. The most important part of a great blurb is how you end it — a cliffhanger your lead character finds herself hanging from. But never give away the end game. Don’t tell how the story ends. Your reader should feel connected with your lead character by now and be excited to know how she overcomes the challenge. Otherwise, your reader doesn't have any incentive to buy your book and read it. The most common mistake indie authors do is having a lengthy blurb. After all, your book is your baby and you’ve invested hours and hours into writing it. So, obviously, when writing the blurb, you won’t be able to cut down the story, the sub plots, the major twists and all those interesting things. Then your blurb ends up being long and loses its compelling power. Remember, your reader often reads your book’s blurb in a crowded place, a bookstore or a shopping mall where there are lot of sounds, shoppers running around and probably your reader’s little child crying for chocolates. So you need to have a short yet strong blurb. 200 to 250 words is a good length for your book’s blurb. If you can keep it under 200 and still make it compelling, that would be perfect. Split it into little paragraphs of one to three lines to give it a feeling of urgency. Sure, you can. You might be unable to trim it down because of, well, the above reasons. But you can write a blurb that best reflects your story and then have it edited by someone. This is where you need a fresh pair of eyes to go through your book, your blurb and then edit it to reflect your entire book but without giving away any crucial plot-related details or being too lengthy. A blurb should ideally have three important characteristics. If you are writing fiction, use emotional words and phrases like ‘spine chilling’, ‘loving and caring’ or ‘mortally dangerous’. It helps to set the tone of the book and connect with the reader’s expectations about the story. But don't overdo it as it may sound like a lot of clichés in a few paragraphs. Use the tone that conveys the genre of your book. Most of today’s books don't fit into one particular genre. They fall under a mixture of genres like romantic suspense, murder and psychological thriller or creative nonfiction. So your blurb’s tone should make it clear to your reader what kind of book he or she is going to read. Quotes are a great way to present your book in short compelling manner. For both fiction or non-fiction, you can easily create blurbs with quotes. These can be testimonials from a readers, a mention in press or an award you got for the book. But don’t use more than 2 or 3 quotes. Write your blurb in present tense. It gives the reader a feeling that the story is getting unfolded now, in the present, and also creates a sense of urgency. Blurbs written in present tense also has a freshness to them. This is the blurb of Harry Potter and the Philosopher’s Stone as appears on Amazon. You can see Harry before your eyes; how he feels being trapped in a house, how he feels when he goes to Hoagwarts and what adventures get revealed in his life. Now, try imagining it written in past tense? Can you still feel the same? Or do you feel like the story happened to Harry in the past and there’s nothing adventurous happening in his life now? Which kind of blurb would compel you to buy the book? This is the blurb of Kathy Reichs’ Bones Never Lie. It’s very crisp and short. The killer of young women. The monster. And the one who has now come back. So there you go, the important aspects of a good blurb. But to stand out from the competition (read: fierce competition) from other self publishing writers and also from big players with a lot of bucks to boost marketing and distribution, you need more than a good blurb. Writing a perfect Blurb is not a science and cannot be explained in an article like this; it is an art but this article is a good start. This is an excerpt from the chapter Writing The Book Blurb from my upcoming book Your Guide To Self-Publishing. In the original chapter, I discuss in depth about writing book blurbs that compete with those published by traditional publishing houses. We look at different styles of writing a blurb and which is right for your genre. We will look at more examples and go through a simple framework to write your best blurb. We all know this saying. But that’s how your readers would certainly judge your book. By its cover. If you’re publishing as an ebook, it gets even more trickier. This is how a Kindle ebook looks like on Amazon’s website (I tried to keep it the exact size it is on Amazon). Now, take out a printed book, keep it next to the screen and see how huge it looks. With a printed book, getting attracted by the large cover, bright colours and captivating fonts is easy for a reader. But getting attracted by a cover that’s this tiny? Hmmm! So how can you create professional looking and aesthetically pleasing cover for your book? Let’s see 5 steps in which you can achieve that feat. Note: Click on the pictures in this article to see them in expanded view. If your book doesn't look great on outside, your readers are much less likely to peek inside. What I call a Subject is the main character or object on your book cover. Now, this would change from one book to the other. If you’re writing a crime fiction, your subject might be your lead detective or someone who represents the victims. If you’re writing fantasy or adventure, you might choose a magical object your hero pursues (like a wand) or a place where your heroine went on an adventure (a mountain). It would be entirely based on your book’s story but it’s important that you have a clear subject in mind before you start designing your book’s cover. I’m picking both books written by the same author to show the differences. Brida is about a girl who goes in search of magic and meaning of life. The main subject used is the picture of a girl who represents Brida herself. The thick croplands she is walking in whose end is not visible clearly conveys a feeling of mystery; that Brida is searching for something. Now, Aleph is a different story. A major part of story takes place in the Trans-Siberian Train from Moscow to Vladivostok (and the towns/cities on that route). The story reveals past and present life mysteries to the lead characters of the book as the journey progresses. The train journey acts as a metaphor. Hence, the railway tracks makes a perfect sense for the cover. The railway tracks also symbolise the two main characters of the story, Paulo himself and Hilal, a girl who joins Paulo on his trip, and the fact that their lives can never intersect, just like the railway tracks. However, there’s an important factor to consider here. While Brida’s cover gives the intended feeling and tells the reader how the book is going to be, Aleph’s don’t. If you walk into a bookstore or visit Amazon and see Aleph, you cannot imagine what the story is. But Paulo Coelho is one of the leading and most renown writers in the world and his name itself is enough for the book to sell. When you imagine the name of an indie writer there, Aleph’s cover risks being ignored. Before moving to the other steps, please note that the cover should ideally be different for ebooks and print-on-demand books. Ebooks are shown as tiny icons and are displayed in low-resolution while printed books have high resolution and are printed on glossy finishes and high quality papers. Ebooks should not have too bright colours or designs that feature minute details while print-on-demand books can't have low resolution images or stock images and should have details that don't pixelate when printed. They can afford to have high level of details in the design. One test you can use is compressing cover design into a tiny jpeg or png image and see how it looks for ebooks. You can print out a design on a high quality paper and see how it'd look on a printed book. As one design cannot take advantage of the benefits ebooks and print-on-demand books offer, I strongly advise to create two cover designs for both formats. But the differences should not be too much to make the reader think both books are different. Only subtle changes in the background or colour combinations, minor changes in fonts or small differences in details are to be done. Now you have your subject. But you need to place your subject in an environment which, when combined with your subject and the title of your book, tells the reader a story. This is where many of the self publishing writers tumble. They think complex designs with lots of elements would attract readers. It’s not always true. I personally like minimalist designs because they are easier to create, are clear at conveying meaning. I’m not saying complex graphics are bad; in fact I’m myself opting for such a detailed cover for my coming novel Finding Nour. For instance, Harry Potter series uses complex designs efficiently. They are not only beautiful but also tell a story. You can see The Deathly Hallows (Hardcover) and The Goblet of Fire (Paperback) versions below. Let’s see another kind of example. 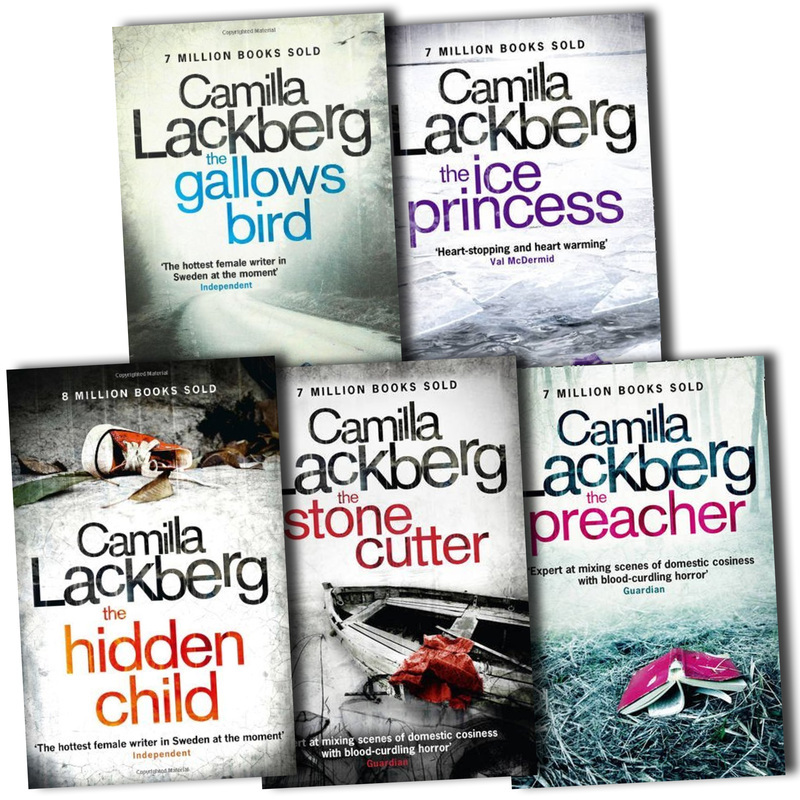 This is the cover of the Swedish version of Camilla Lackberg’s The Ice Princess. You can immediately imagine it’s a mystery with some dark feel to it. This cover is also a good example of using details in the background to your advantage. The scratches on the wall above, the muck at the window and the shadows on the bathtub and the floor that looks as if they have been casted by the moon outside adds to the aesthetics and intrigue of the picture. This cover is one of the best examples of how to design a crime/mystery/suspense novel covers. Let’s see an example of minimalist design. Where no complex details are needed. Camilla Lackberg’s another book, The Mermaid, predominantly focuses on its subject. And the background is quite simple and natural - water. The white fonts appear attractive against the dark background. The author's name is larger than the book's Title given the fame of the author (more on text elements and fonts below). What’s the other things that appear on a book cover? Yes, Title of the book and the Author’s name. These are a must. But you can have some other elements to convey information to the reader. But beware, don’t fall into the trap of shoving a lot of information on the cover in the hopes that it’ll attract more readers. In fact, it does the opposite; it makes the reader go away because he/she gets confused by the cover. The first additional information you can have is a small line saying what the book is about. A tagline. Or you can tell about an award or critique the book has received, reviews by some industry expert or magazine or if it’s a part of a series, you could indicate that. When choosing the additional elements, it’s quite important to take care that the cover doesn't get messy. If you look at the cover of The Mermaid above, you do have some place to have a one-line information without making the cover messy. But the Harry Potter and the Deathly Hallows doesn’t. Get my point? Let's look at an example. Salman Rushdie’s Midnight’s Children is a story of India after independence beautifully crafted and presented. Note how Winner: Best of the Booker is highlighted on the top. It’s quite important because The Best of the Booker is a special prize awarded in commemoration of the Booker Prize's 40th anniversary. Eligible books included the 41 winners of the Booker Prize since its inception in 1969. There are more additional elements like the New York Times Bestselling Author of The Enchantress of Florence above the author’s name and also a review by The New York Review of Books. Even this cover won’t look great as a tiny icon on Amazon but it still works as important elements, the Title and the author’s name are clearly visible. Now that you’ve decided all the things that go on the cover, there’s only one thing to work on. Fonts. Yay, my personal favourite. Face. Style. Size. Colour. A lot of combinations to add that extra flare to your cover. You’d need two sets of fonts for your cover. There’s two reasons why you need different font sets. Firstly, a single font face all over your cover is quite…boring. Secondly, you’d ideally want to highlight certain text more than others. You can use a single font face for the Title of your book and the author’s name. But make sure they differ either in size or colour. That’s the easy part. It gets tricky when choosing fonts for additional elements we have discussed above. Your awards, reviews or other such things should not overshadow the Title and the author’s name. They can be in a small different font, usually in lighter shades, at the top or bottom edge of the book. But make sure there are only subtle differences in these two sets of fonts. Don’t use a Helvetica and a Comic Sans, please. What kind of fonts should you use? This is a valid question especially because there are a lot of fonts out there. They should be super-easy to read. They should blend in with the background graphics. Anything cursive, fancy or twisty is bad. Remember, your readers will see your book as a tiny icon first. They should clearly read the title (though the book’s name will be clearly mentioned below the icon on these websites, a font that looks confusing still won’t attract the readers). You should also need to know a little about the two font families: Serif and Sans Serif. I’m not going into the details of these two font families or their inherent differences. You can know more about that here. But there’s one thing to remember. Any one font family is not suitable for both ebook and print publishing. Serif is the best for printed books as the letters are more distinguishable for the brain so that the brain can recognise the letters in less time than it needs to understand the sans-serif letters. But sans-serif is the ideal font for the ebooks because, ebooks which are published online and read on the screens, are of low resolution than printed books (almost 1/3rd resolution of print). Serif is hard to read in low resolution. Hence, sans-serif is ideal for ebooks. Times New Roman, the old and often considered boring font is a serif font while Arial, yet another boring old font is a sans-serif font. Your fonts should look attractive but, at the same time, they should not jump at your reader. Size matters too. Nothing less than 11 or more than 16. They shouldn't shout. Use colours that are neither too bright nor too dull and that would naturally blend in with your background. Go on Amazon and see some covers; you’ll see many with blue fonts on black background or yellow fonts on the white one. Come on, who can read that? Let’s look at some examples to better understand (now that we have seen about the subject, the background, elements and fonts, let’s consider all of them in these examples). Camilla Lackberg’s English version books maintain a consistent theme in titles, fonts and background. Having a consistent style will help when creating covers for books in a series. Your readers will be able to identify them quickly. They also promise consistent quality not only of the cover but throughout the book. A Long Way Gone is a nice example of using minimalist design with a real-world image. The subject, the boy, is featured on a side but because of the blurring of the background and carefully chosen fonts, the boy still shines. Speaking of fonts, though I’m not a big fan of lower case fonts, they seem to work well. However, words with starting letters in upper case (known as Title Case) would have worked efficiently too. Because the Title is long, all upper case fonts would have hurt the design. Ideally, all upper case fonts are good for a Title with 3 or less words. In this example, the Title and the author’s name use the same font face, colour and size. And the caption, Memoirs of a Boy Soldier is a refreshing addition to the cover and is made to look different because it's a caption. All we have discussed so far is how to design the front cover for either ebook or print-on-demand books. It’s the most important part of the book but back cover is not something that you can easily ignore. There are certain elements of back cover that readers expect. Front cover makes your readers pick up your book. Back cover makes them buy it. This is true at least for print books but remember, your readers can see the back cover of your print-on-demand book too on the internet. The first thing they will look for is a strong compelling blurb with powerful narrative and wording that attracts your readers into buying your book. It should be short, crisp and intriguing. My strong suggestion is not to use your picture on the back cover. Unless you’re already famous, your face isn’t going to sell your book (don’t feel sad, you still are very beautiful). Instead, have your picture and a small biography on the inside of the cover, either in the beginning or at the end. Please note that the blurb is not same as the book description. In my upcoming book Your Guide To Self-Publishing, I clearly make a distinction. A blurb is what appears on your book’s back cover. A book description is what appears on a website and is more detailed than a blurb. You need a little box for your barcode/ISBN. If you publish using print-on-demand services like Amazon’s CreateSpace or Lulu, they will generate an ISBN for you. But they will remain the publisher of your book. Alternately, you can buy an ISBN yourself and then you will be identified as the publisher of your book. Whatever you do, there should be a place for your book’s ISBN to put. You have testimonials? YOU HAVE TESTIMONIALS? Heck, keep them on the back cover. If you have more, put them in the beginning of your novel. USE THEM. Readers believe testimonials more than your blurbs or descriptions. A few qualitative testimonials are what you need. The spine is the easiest thing to design. Keep your book’s Title and author’s name on it and you are good to go. Make sure you use the same fonts on spine that you used on your front cover. Also use the same background colour on your front, spine and back covers; it should look naturally flowing. Let's look at two examples that uses the back cover and spine in the most effective way. The Hobbit’s back cover introduces the book as the prelude to The Lord of the Rings which is important given the latter’s fame. The blurb is short and mentions adventures, trolls, goblins, dwarves, elves, giant spiders and dragon-guarded gold. It also mentions lighter moments like good fellowship, laughter and song in contrast. The blurb clearly conveys what the book offers - adventure to attract children and the value of fellowship and friendship to compel parents to buy it for their children. There are three reviews which encapsulate the soul of the book in a line. Then the bottom part is dedicated to the price, ISBN and the barcodes. To Kill A Mockingbird is one of the must-read books for any writer, no doubt. It’s cover is also one of a kind. A sleek flowing design across the front, spine and the back. The blurb is short and very effective. Awards, number of copies sold and the kind of story it is - everything has been condensed into the blurb. The design itself is beautiful creating a contrast of age between the characters on front and back covers. The spine is a natural extension of the design instead of a long black box. The hole in the trunk of the tree appears on the spine when closed but completes one large picture when the book is opened - it’s a really aesthetically pleasing design. Designing a book cover is not science, it's an art. A beautiful art. A art that requires skill as well as creativity. If you can't design a cover that presents your book in the most beautiful way possible, hire an expert to do so. You don't need to invest a lot in it but make sure your cover is perfect because that's what your reader will judge your book by. If you are concerned about writing blurbs, author's bios or book descriptions, subscribe below to get updates when I publish posts on them in coming weeks. This is an excerpt from the chapters Designing Your Book's Front Cover and Designing Your Book's Back Cover from my upcoming book Your Guide To Self-Publishing. In the original chapters, I discuss in depth about how to design book covers that compete with books published by traditional publishing houses. I also talk about other elements of self-publishing where quality matters a lot (even more than your novel’s story), what kind of fonts are best for what kind of covers and different tools you can use to design high quality covers for ebook and print versions. We will look at more examples and see how you can design the perfect cover for your book. We will also go a little deeper into back cover design, blurb writing and Author's bio. It’s the #NaNoWriMo (National Novel Writing Month) and you might have taken up the challenge of penning down 50,000 words this month. Great. That means you’re interested in writing a book and probably even making it available to others. I’ve decided to share some points to help you with writing and self publishing your works. Let’s start today’s post, the 1st one in this series, by busting the myths of self publishing. There are many assumptions (read: beliefs) about self publishing. Most of them would hurt you as a writer if you believe them. We will talk about 3 such myths and why you should focus on working on them — quality, marketing and strategy. Many have this opinion that the quality of a self-published book is far below that of a book published by a traditional publishing house. This is not completely true. But, alas, this is also not completely false. It’s true that many writers out there want to push out a book quickly and compromise on the quality of their book. A sloppily mashed-together front cover, an unappealing formatting and, the most irritating of all, the writing that’s neither proofread nor edited makes a book far less qualitative than its peers. As the self-publishing world is full of such books, many readers think that all the self-published books are similar. This is a great opportunity for the indie authors to want to stand out from the competition. Note here: your competition is not the other self-published books. Your competition is the traditionally published books written by well known authors. You‘ve to match their quality levels. You’ve to beat them on their ground. Publishing is not only about the story; it’s also about how you present your story. Of course the resources pumped into a traditionally published book’s designing, publishing and marketing are huge. But that doesn't mean you cannot afford high quality product with limited resources. Create a high quality product whose front cover tempts the viewer’s eyes to keep staring at it. Create a book with beautiful formatting which goes easy on the reader’s eyes. Create a story which is presented in a magnificent way with no spelling mistakes, no grammar errors or no carelessly framed sentences. When your reader finishes your book, he/she should be craving for the next one. Believe me, this is one of the top concerns I hear from self-publishing enthusiasts. Marketing sounds like some rare fruit hidden in the Amazon forest. Come on guys, it’s easier than that. Of course those giant publishers pump a lot of money into marketing and advertising, buy ad spaces and create beautiful graphics or videos. But it doesn’t mean you can’t do all that without emptying your pockets (and your bank accounts and your house and…). All you need is a well-planned marketing strategy. Start talking about your book even before you finish and publish it. You do have a place to start from; your own network. Your friends, family and personal network. Start with your friends and family and encourage them to share a word with their networks. Keep expanding from there. It’s obviously not easy. But it’s not unbelievably hard either. Use social media to engage with the people who have an interest in the genre you’re writing in. Join groups on Facebook or communities on Google+. There are a lot of them for almost every genre out there. There are groups for writers to share tips and insights. There are groups for readers to share great books. There are communities for self-publishers to support each other. Join them. But don’t blast them with ads or link dropping. Be genuinely interested in them and share your knowledge with them (if you’re not genuinely interested in being helpful to the communities, I don’t see why they should be genuinely interested in you or your book). Create some anxiety and find opportunities to share the updates. Did you reach the final chapter? Did you finish the book and now working on the final touches? Did you find an awesome proofreader to go through your book? Shoot a post sharing your enthusiasm. Ask for feedback. Be genuinely interested in engaging with the groups. But don’t get overwhelmed by being active on all the social media platforms. Try all of them and find 1 or 2 that better fits your personality and offers you a large reader base. What you need to understand now is that you can embrace marketing even with limited or no resources. Your goal should not be to sell a million copies. Instead, it should be to build a loyal fan-base who would read your novel and share a word with their networks. What’s your intention behind writing/publishing this book? I usually get one of these 3 common answers. Ideally, you’d like to reach as many people as possible and make them read your book. To do that, you need a strategy of what to do and when to do that. You want to publish more books, I believe. So this first book should be your stepping stone for success. The goal should not be to make more money. Instead, it should be to get noted among your genre’s readers and make some loyal fans who will be looking forward for your next book. You need to focus on building relationships with your readers. Starting from pricing your book to which platform you want to publish on, everything should be carefully planned out. It should be priced in such a way that it’s not too low or too high. Too low price gives an impression that it has been written by an amateur writer and can be low on quality too. Too high price may scare your readers away. Especially when you’re competing with the writers who have already published tens of books and have millions of readers, you cannot compete on the celebrity front. Instead you need to compete on the price, attractive blurb/summary/book description and cover (often many writers underestimate the power of the cover; that’s the first thing your potential reader will see). There’s more your strategy should cover the tricks of the platforms you want to publish on, the different things that go into the book or on to the webpages on which your book is featured/sold and the ways to communicate with your readers. Self-publishing is not an impossible feat. With a little planning and a few resources, you can publish a successful book. This is an excerpt from the chapter The Myths of Self-Publishing from my upcoming book Your Guide To Self-Publishing. In the original chapter, I discuss about how to set your goals based on your intentions, how to integrate your strategy with your goals to achieve them and how to develop each part of your strategy. I also talk about other elements of self-publishing where quality matters a lot (even more than your novel’s story), how to target your readers and how to pick the right platforms for ebook and print versions. We’ll also see how your commitment will affect the outcome of your self-publishing journey and how your patience will be tested. We finally wrap up the chapter by making some key points you need to focus on while developing a self-publishing strategy. This blog is for self publishing enthusiasts. If your dream is to write & publish your book, you'll find everything you need, the tips, the ideas and the information on must-do elements, everything here.